My PhD is in galaxy dynamics, which probably explains why I'm unemployed at the moment. However, it also means I know how to calculate orbits, and the one illustrated here is an oddity I stumbled on back in the 1980s when I was doing postdoctoral research. 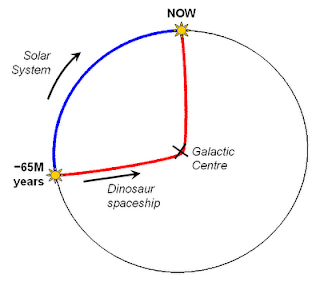 I call it the "dinosaur orbit" because it's the sort of thing the dinosaurs could have done just before they became extinct, around 65 million years ago... if they'd had a spaceship that is, and pointed it in the general direction of the Galactic Centre. 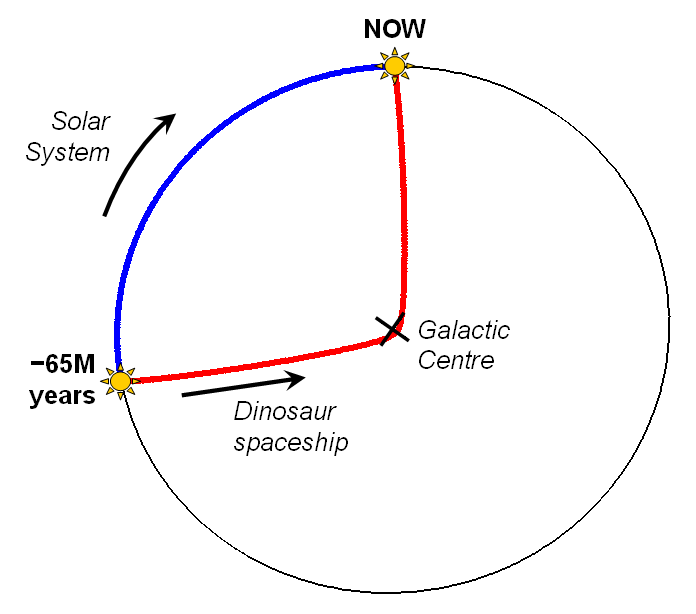 With a judicious choice of speed and angle, the spacecraft would have flipped around the Galactic Centre and be just about arriving back where the Earth is now (the latter having moved, together with the Solar System as a whole, on its own orbit). The graphic is a real simulation result, not a sketch -- but to get the boomerang effect you need to have a really massive black hole right at the centre of the Galaxy. Without this, the spaceship wouldn't be deflected enough to come back to the right place. Interesting. You may be aware that some have suggested a connection between UFOnauts of the "reptilian" sort and dinosaurs. You, a highly qualified scientist, have just given support (albeit unintentionally) to this hypothetical connection. I love it: the "reptilian" aliens are actually returning descendants of the dinosaurs. Doesn't get much better; I love it. Thanks Ross. I avoided making this connection in the post, although I admit it had occurred to me as an idea for a work of fiction!